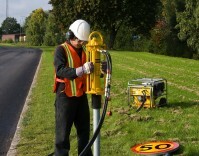 Post drivers can be used to drive in wooden and steel posts and piles, H, C and I piles and small/lightweight sheet piles when installing road barriers or signals, fences, anchors or bank defenses. 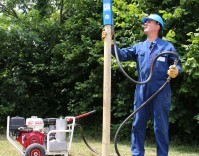 We offer a complete range which can be powered by a compressor, a hydraulic power plant or an existing hydraulic source (crawler or excavator). The range also includes standalone (petrol driven) units. 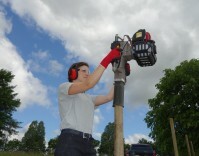 The PAJOT pneumatic post drivers are the easiest to use, are durable and simple to maintain. The petrol post drivers are the most compact and lightest in the range and can handle all types of square or round profile up to 107 mm. These post drivers feature an integrated motor for standalone use. ATLAS COPCO hydraulic post drivers can be used on all types of square or round profile up to approximately 150 mm and small/lightweight sheet piles.